Canada Ski Blog - Canada-Ski news, views and travel specials on resorts in the Canadian Rockies and Western Canada. Here are the current snow conditions for some of the ski resorts in the Canadian Rockies and Canada. I can’t believe the winter season is coming to an end when the snow conditions are still so great! Finally, we have a bit of footage to show just how great the powder has been in 2011! The video below shows a bit of backcountry action at Sunshine Village in Banff National Park. It was shot just a few weeks ago. We hope you have managed to get out and enjoy some of the best snow conditions in years in the Canadian Rockies and Western Canada! 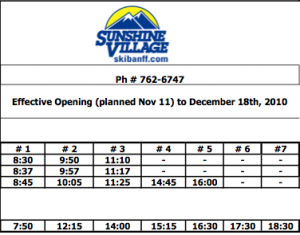 There is still chance to get some skiing and riding in – Sunshine Village doesn’t close until late May! 2011 has so far brought us incredible ski conditions – the best in years across Western Canada. The best thing of all is that it just keeps coming and coming! Environment Canada predicted a late spring which is so far proving to be true. Last Sunday was the official start of Spring and so far the temperatures have been below average and the snow keeps coming. There is a lot of snow to melt before we see any of the spring vegetation emerge! We get contacted a lot about heli-skiing and heli-snowshoeing in Jasper National Park. Just like all National Parks across Western Canada, you can not do either of these winter activities within the National Parks and so you will always have to travel a little way out to get to the heli-base. Out of Jasper, you can drive to Robson Helimagic’s base in Valemont, British Columbia. This is about a 1.5 hour drive along the scenic Yellowhead highway. You drive out of Jasper National Park and through Mount Robson Provincial Park to get to the heli-base. You may even see a moose, elk or deer enroute! If you don’t have a vehicle, transportation can be arranged. We were just notified today by Robson Helimagic that they are revamping their ski program for the 2011-2012 winter season. No more vertical (yes you heard me right!). Basically you will buy heli-time. With these proposed changes, a group of 1-4, for example, will pay one price regardless of how many are skiing. This gives skiers and riders better skiing options and makes private group skiing incredible value. Robson Helimagic has access to about 1,000sq Kms of terrain in the remote western slopes of the Rocky Mountains. Their season typically runs from January until the end of March. For more information, visit the official website of Robson Helimagic. We love comments – feel free to post your heli-experiences below! Whistler received 20 cm in the past 24 hours, that’s 75 cm in just 2 days! Kicking Horse was another powder King of the day. They received 38cm in the past 24 hours, that’s 50cm in just 2 days! Sunshine Village reported 25cm in the past 24 hours, that’s 38 cm in 2 days! Lake Louise reported 25cm in the past 24 hours. Banff Norquay received over 20cm in the past 24 hours. Jasper Marmot Basin received 27cm of fresh over the past 24 hours. Panorama received 27cm in the past 24 hours, that’s 32 cm in 2 days! Nakiska received 24 cm in the past 24 hours, that’s 32cm in 48 hours! Thank you Mother Nature and please keep the snow coming! Happy Valentines to you all for tomorrow – we’re feeling the love! Firstly, HAPPY NEW YEAR to you all. I know we have not been blogging as frequently as we would like to, but it is the ski season! In the last 12-24 hours, ski resorts in Western Canada have been receiving a nice bit of fresh. January is a great time to ski the Canadian Rockies and Western Canada as prices are rock bottom and there are no crowds. The heavy snowfall typically received in January also makes it a fantastic time to visit for some WC-POW action! Some early-bird deals have been extended until January 15 2011 – not what I would call “early” as we are already well into the season (but best not to complain). Deals include 50% OFF loding at Panorama Ski Resort for stays of 5+ nights as part of a ski package through Ski Holidays Canada. Panorama was sold by Intrawest last year, and the new management at Panorama are really making an excellent attempt with providing tour operators with awesome deals. There is also a scheduled Panorama service from Calgary YYC airport making it easier to get to Panorama ski resort. If you have not tried Panorama – you should make it your next ski holiday destination. Discounted Banff ski passes are still on sale too. The Tri-Area pass covers Banff Norquay, Sunshine Village and Lake Louise. 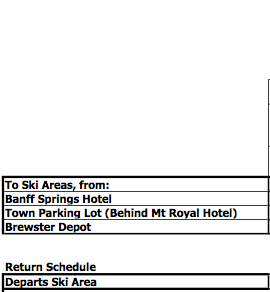 The ski shuttles from Banff currently only pick up from three locations with exception to the Lake Louise ski bus which now picks up at most hotels in Banff. Thank you Lake Louise – we salute you! 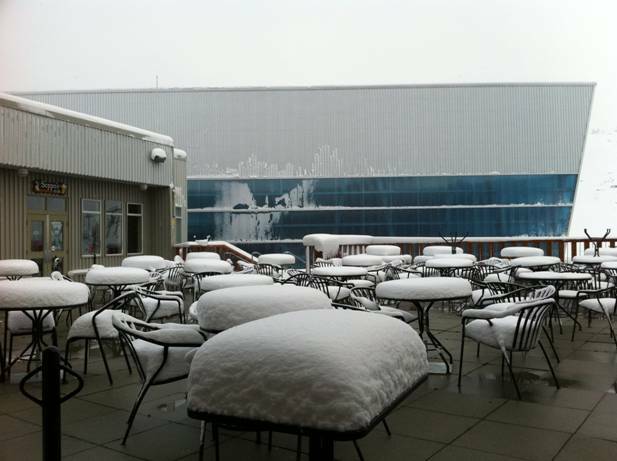 Whistler Blackcomb – 26cm (10in) over the last 24 hours and it’s still snowing! MEGA-POW baby! Okay, now what are you doing still sat reading this blog post – get out and enjoy and we look forward to any comments you have! Best wishes for 2011 from Canada-Ski.com! Exciting times here in Western Canada – the ski resorts are starting to open and the long-term season outlook is looking very promising with La Nina predicted to hit which will bring lots of snow! The Lake Louise Ski Area was the first ski resort to open in Canada on November 5th 2010. Jasper Marmot Basin opened today so too did Banff Mount Norquay and Nakiska which started opening weekends until early December at which time they will open full time for the season. Whistler Blackcomb is opening six days EARLY on Friday, November 19 at 8:30am. There are another 37 ski resorts in Western Canada not mentioned here – 11 in Alberta and 26 in British Columbia –> more ski resorts in Western Canada. For immediate updates on ski news in Western Canada follow @HolidaysCanada for their ski holiday news. 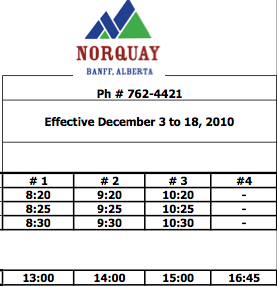 Please find attached the Banff Ski Bus Schedule to Banff Mount Norquay, Sunshine Village and Lake Louise. It is effective from tomorrow, Friday November 5th 2010, and is valid through to December 18th, 2010. 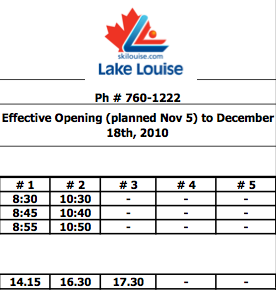 The Lake Louise Ski area opens tomorrow as planned – HOORAY! *A Tri-Area lift ticket includes the bus trip. **Children SKI FOR FREE with a minimum purchase of an adult ski pass through Ski Holidays Canada. Up to 4 children can SKI FOR FREE per adult. This schedule is subject to change. Please speak to the hotel front desk or concierge for exact times. 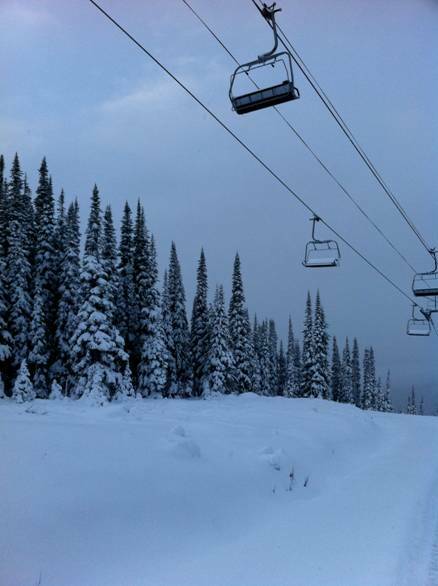 Lots of snow already at Fernie Alpine Resort. The video below was taken about a week ago. They received 40cm of new snow on October 26th! Opening day is set to be epic – scheduled for December 4th 2010. Excited?! We are!!! SNOW ALERT! A heavy Pacific storm has been hitting Whistler Blackcomb this weekend, dropping between 25-30cm of snow at higher elevations. The freezing level is expected to remain steady with more periods of snow forecast for this week. Meteorologists are calling for a La Niña weather cycle for the Pacific Northwest, meaning cooler temperatures and more snow than Whistler Blackcomb’s annual average of 34 feet/10.25m. Temperature Outlook – Freezing levels are currently around 1600m or the Chic Pea on Whistler Mountain, and are expected to remain somewhat steady through Thursday. Forecasted Snow – With the storm continuing to stick around through to the end of the day we can expect up to 7cm of snow. 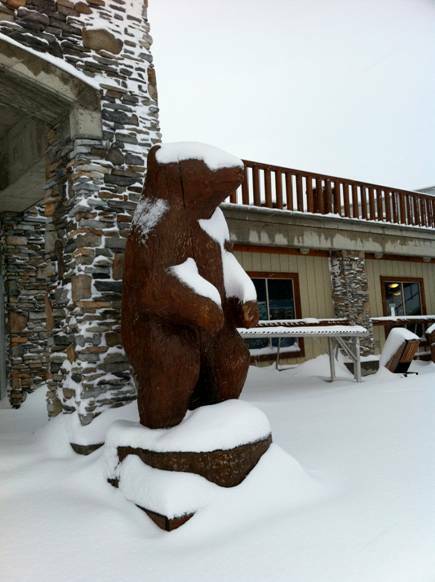 New Snow Last Week- 25-30cm has fallen over the upper part of the mountain throughout the weekend and Monday morning. Pictures – The photos below were taken by Whistler Blackcomb’s Doug Burnett, manager of the Roundhouse Lodge and Steep’s this weekend. The movie, “A Life Ascending” was recently finished and is doing extremely well on the festival circuit. It will be playing soon at the Banff Mountain Film Festival in Canada on Saturday, October 30, at 12PM and is definitely worth checking out! You can view the trailer below or check out their website for more information.